Mainly, there are two ways of looking at this. Racha(n)th jeea rachanaa. Waheguru Jee has created the creation, the rachanaa of the jeea, the soul. Waheguru Jee creates the soul, maath garabh asathhaapana(n), and places this soul within a body in the garabh, in the womb of the mother. Asathhaapana(n) means to place within. Another way of looking at this is racha(n)th jeea rachanaa, O jeea, O soul, you are racha(n)th, you are completely imbued with, you are completely intoxicated only with rachanaa, the creation, the maya, the illusion of this world. That's all that you're thinking of. Maath garabh asathhaapana(n). It is this love for material goods, it is this attachment, it is this never-ending fire of desire which leads you to be placed within the garabh, within the womb of the mother again and again, to come into the cycle of rebirth. Saas saas, with each breath, samara(n)th, meditate upon Waheguru. Mehaa - the greatest, agan - fire in this world, the fires of desires and ego and hatred, n binaasana(n), will not destroy you. In this world, if you remember God, the fires of desire, ego and hatred will not burn you within. Guru Sahib Jee is also saying that in the mother's womb, with each breath you are remembering God, and the heat in the mother's womb, the fire in the mother's womb did not destroy you because your connection, your focus, your attention was completely centred upon The Almighty. In the womb, mukh thalai. Mukh - the head was facing thalai - downwards, pair ouparae, our feet were upwards, we were upside down. Vasa(n)dho kuhathharrai thhaae. We were in a very kuhathharrai means a deep, dark place, and that's where we were in the mother's womb. Naanak so dhhanee kio visaariou - How have we visaariou - forgotten That dhhanee, That Lord Master Waheguru. Oudhharehi jis dhai naae - through Whose Name we were created. Oudhharehi - we were liberated, we were brought into the world. God took us out of that enclosure of the womb and showed us this great world, brought us into this human life, so that we can meditate upon Waheguru and merge in with Him. 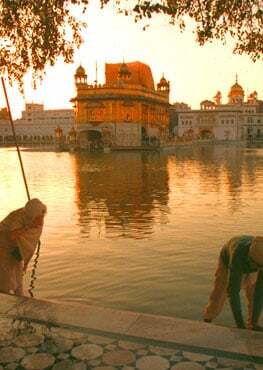 Gurmukh piaareyo, Waheguru Jee is saying how have you forgotten those times? Remember that time and thank God that He has blessed you with this human life. This body was created though the union of rakath and bi(n)dh, the egg and the sperm, joined together to create this body. Where was this body created, where did the creation take place? In the oudhar, in the womb of the mother, in that agan, in that heat of the mother's womb. At that point gurmat says our connection is complete, our focus, our consciousness is completely focussed upon The Lord. Har simarath, remembering The Lord, thoo naa jalehi - we were not burnt by the fire of the mother's womb. We were not burnt by the heat of the mother's womb. Man than our dhhaar - with your mind, body and soul, dhhaar - take within you to your our, to your heart That Lord Who saved you at that point. By bisarath, by forgetting Waheguru, sukh kadhae naahi. Kadhae means at any time, naahi means never. You can never find sukh, peace if you forget God. Jaasehi janam haar, those people that have forgotten Waheguru jaasehi, they leave this world janam haar, losing even the body that they came from on this earth.